winning with a masterful 1-1 performance. Anstie won all three sprints – the Qualification Heat and then both motos on Sunday – to deliver the team’s first triumph of the year, first since Lommel, Belgium last summer and first with KX technology. Setting off from his first Pole Position of the season after a convincing victory on Saturday and the Qualification Heat, Anstie took the KX250F to a second win of 2015 in the first moto. The Latvian terrain was a challenging mix of hard ground, bumpy ruts and sandy soil and with heavy rainfall on Sunday morning the course became more technical and muddy. Anstie pushed into the top five around the first corner and in the formative stages of the opening race as principal rival for the chequered flag, Tim Gajser, crashed and restarted from last place. Max took four laps to catch and pass Jeremy Seewer and Davy Pootjes before chasing after local hope Pauls Jonass. 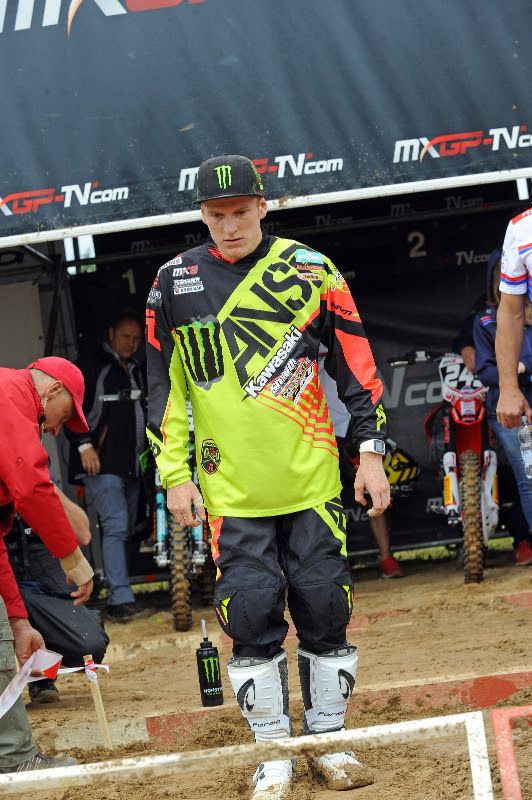 By lap eleven of seventeen Anstie had the lead and his superior technique in cresting and using the Latvian bumps helped him pull clear by a comfortable margin. After owning a chequered flag in Germany two rounds ago Anstie delivered the goods, collected the 25 points and put himself in a prime position for more silverware in the second moto. Despite a threat from Valentin Guillod around the opening corners – the Swiss then crashed – Anstie was able to assume control of the second moto in the first minute. He set about building a cushion at the front and avoided mistakes for a reasonably straightforward run to. Max totalled a maximum 50 points in Latvia and means that he sits seventh in the MX2 standings just 33 from moving up to the top five. The team move directly back to England and the workshop this week with the relatively short trip to Foxhills up next for round six of the Maxxis British Championship. Anstie leads the way in the national competition and will be looking for more glory come the weekend.